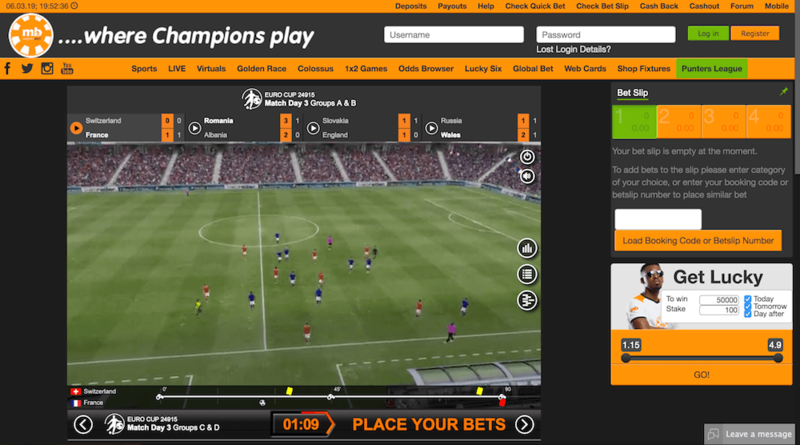 This is a betting site which hits you like a ton of bricks with its bold, boisterous style and the sheer amount of content on screen. With so much on the surface, we hope that Merrybet has enough room left to have hidden depths elsewhere. 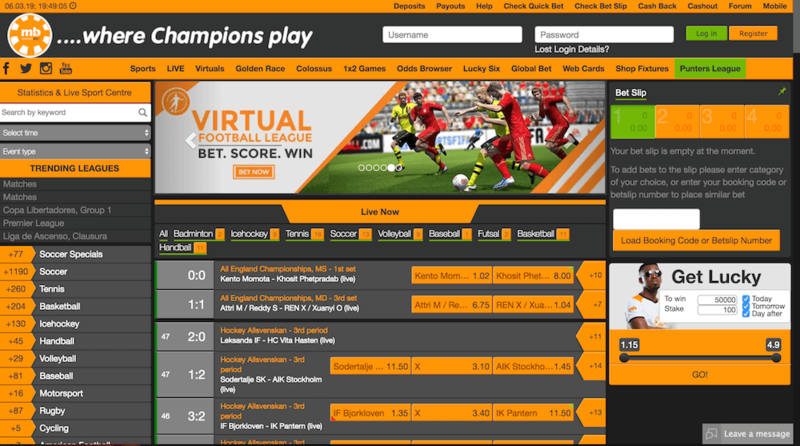 Arriving in 2013, Merrybet – with its near-neon orange colours and ultra busy homepage – may be a bit of an acquired taste in terms of its aesthetics. However, it certainly looks from the offset both exciting and full to the brim with content. There seems to be so much here that they can barely fit everything in. Despite that, there doesn’t seem to be anything which we would consider a traditional welcome bonus on display, although there are some other additional extras. This is a shame because it goes against some positive first impressions. Hopefully, that’s not the case elsewhere and Merryberry truly is as action-packed as it seems. We have already mentioned our initial disappointment at the lack of a welcome bonus. Unfortunately, this is something that is felt in general when it comes to promotions. That’s because, with the exception of one example, Merrybet is completely barren of any bonuses at the time of writing. We hope that this is something they change soon, especially as one of the main selling points for the site initially is how much there seems to be available. To see this part of the site almost completely overlooked is a real shame. We say almost because there is a Cash Back offer. We’re going to take a look at that, as well as what we view as particularly relevant terms and conditions. 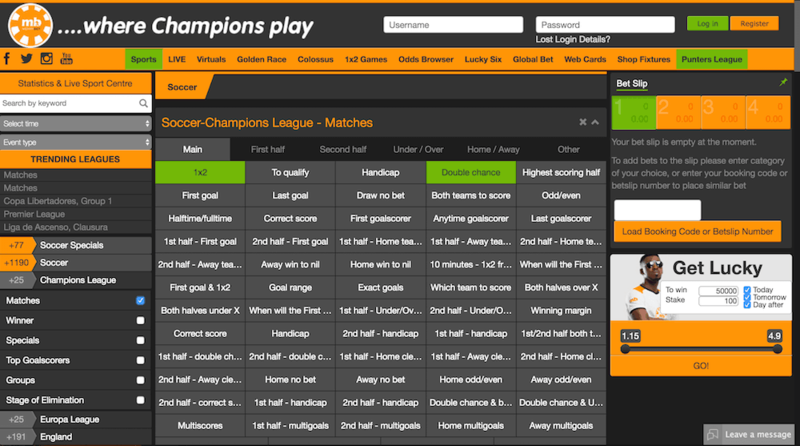 Do keep in mind that these are not the full terms, which can be found on the Merrybet site itself. Cash Back: Get your cashback promo code through your bet slip – which is found on the details within your user history – to receive 5% of your stake back. In order to qualify for the cashback offer, the bet slip must be an accumulator with a minimum of five picks, odds of 1.50 and stake of N200. While the cash back bonus does seem fairly valuable, it’s simply not big enough to carry a whole promotional offering for a betting site. Realistically, how much this matters all comes down to your personal preference. For some, bonuses don’t matter very much and if that’s the case with you, then you may be happy here provided everything else is top quality. It really depends on what you’re looking for out of a betting site. It’s much better news here, as we are pleased to say that Merrybet doesn’t appear to be style over substance when it comes to its betting markets. The initial impressions of a site overflowing with content seems to be largely true. There’s an excellent amount of options here, with a huge number of selections on things like soccer, basketball, ice hockey and more. There are certainly some which were a little lacking when we checked but overall, this is an excellent selection of sports offering. It even includes plenty of different leagues and variety within the sports picks to create what can be viewed as an all-around excellent variety. Not only that but there’s a ton of live options too, and even some left-field betting types like the lucky six numbers game, web cards and punters league. Alongside that, there are extensive e-sport options, with Counter-Strike, League of Legends, Dota and Overwatch having their own sections to choose from. In terms of options, it’s hard to find much to fault here. There is no mobile app available to download but that’s not much of a problem because Merrybet has an excellent selection on its mobile site, which allows you to even switch between mobile types in order to best suit your screen. Not only is everything here – as far as we could tell, nothing significant appeared to be missing – but also the more minimalistic style may actually be preferred by some, as the main desktop site can be overwhelming for certain tastes. Unfortunately, there is no live streaming of sports found on this site, but that is something that is rare for the vast majority of betting sites available. Therefore, we can’t mark Merrybet down too heavily for that. On the plus side, there is a very extensive virtuals section, with some games being deemed important enough to even have their own pages on the main toolbar. As is the case with this site in general, we were hugely impressed with the variety on offer here – which is hard to beat –, as we were with the quality of the video and the experience of the virtuals section too. This is a pretty interesting one because, on one hand, the deposit and withdrawal information is more extensive than the vast majority of sites out there. It includes very in-depth explanations of how to use various deposit methods for instance and even the banks which are compatible with the site. However, it lacks information about minimum and maximum limits, as well as fees. Nonetheless, the deposit options include Paydirect Nigeria Deposit, Bank Deposit, GlobalPay Deposit, Webpay Nigeria Deposit, Zenith Bank Nigeria Xpath Deposit, Quickteller ATM Nigeria Deposit, GT Collections Nigeria Deposit, Paystack card, bank and agent deposit. 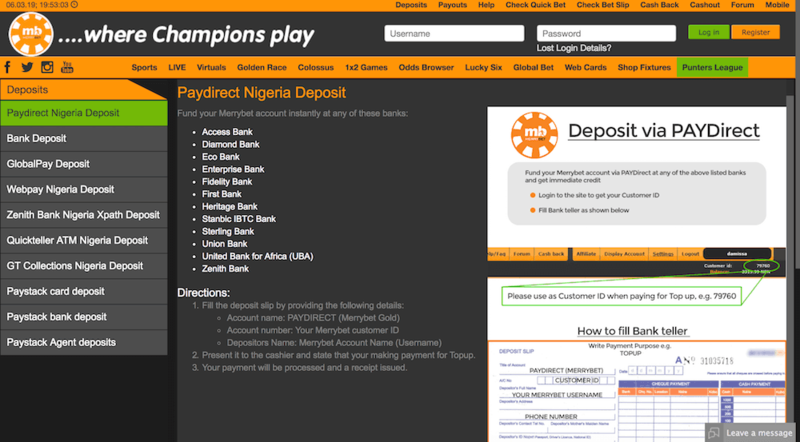 The two payout options include bank and instant payout, with the latter only being available between 8 am and 9 pm. Finally, we were also unable to find much about what identification may be required. To end things on a plus though, they do have a section on responsible gaming. It just seems very strange for them to be so thorough in some areas and then miss others out. This feels like an oversight that we hope Merrybet can rectify. 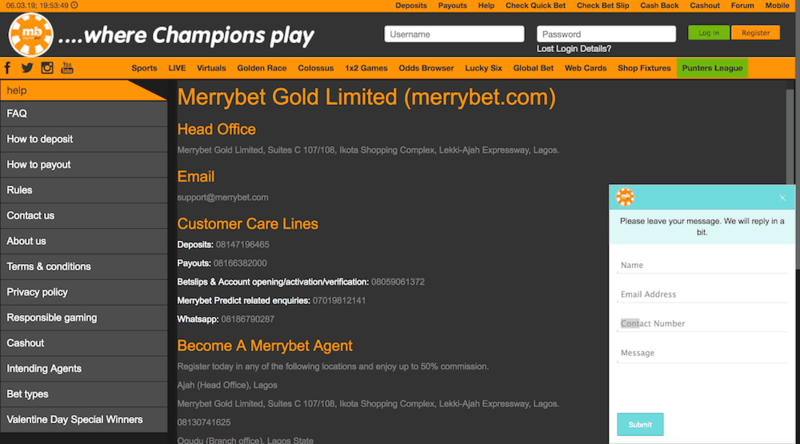 Alongside their help section – which to be fair, does cover a lot of ground – there are two main ways to contact Merrybet. These are through email and through their customer care lines. There are several customer care lines for specific issues, such as deposits and payouts, which is something we really appreciate. On top of that, there is also a chat box, although we couldn’t find specific information on when you can generally expect a reply. Overall though, the customer support options are decent. We were unable to find many customer responses in terms of how useful other people found the customer support team, however. As per the information found on the About Us section of the site, MerryBet Gold Limited – the company which runs the site, as you could probably have guessed from the names – have had an operating license since 2013. According to another area of the site, they are regulated by the Lagos State Lotteries Board. Finally, they state that all information is encrypted with SSL Encryption, keeping your data safe. Its odds appear competitive, but we cannot find any information analysing their odds over any kind of period. Nor is there much in terms of its reputation among customers. There appears to be very little written about the site, meaning we can’t vouch for how reliable others seem to have found Merrybet at this moment in time. That is neither good nor bad news though and is fairly common for lesser-known sites. However, it does mean that we can’t come to a conclusion on the customers’ impression of its reliability. We did find a couple of areas of Merrybet lacking, most notably in terms of its lack of promotions. However, if that’s something that doesn’t bother you too much, then you’ll find plenty to enjoy here. Most of our other criticisms, such as a lack of information in certain areas, should be something you can have cleared up via the customer service team if you have any questions. There’s an absolutely massive amount of content here to enjoy, with their virtuals being almost as impressive as their sports offering. This means that you’re unlikely to need to look anywhere else for your betting options. It’s possible, depending on your needs, but we’d say that Merrybet should have plenty to offer in terms of variety for a large number of potential users. With that in mind, we think it’s fair to say that Merrybet is far from perfect, but has a lot here to build upon.